1912 Born in Ta-dao-chen, Taipei, Taiwan. (also known as Taiwan Exhibition). in the 4th session of Taiwan Fine Art Exhibition. Painter’s Award; founded the action art group MOUVE; organized the first exhibition of the group. 1939 Participated in the Taiwan Fine Art Exhibition showing works of “Miners working in the pit". 1941 Changed the name of MOUVE group into Association of Plastic Arts. 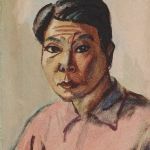 1952 Exhibited miner’s paintings at Tai-Yang Art Exhibition. 1954 Quitted from Tai-Yang Art Association; organized Chi-Yuan Art Exhibition. 1957 Exhibited the paintings of the miners at the National Fine Art Exhibition. entrance exam panel for all the art colleges in Taiwan; inspected fine art education in Japan. charge of the coal mine business; most works showing miners were sketches made on site. 1972 Retired from the coal mine. 1973-75	Travelled to Southeast Asia, Japan, and USA. 1977 Council of the Republic of China Oil Painting Society. 1978 Jury in the 33th session of the Provincial Art Exhibition. 1979 Jury in the North Academy Student Exhibition; exhibited “35 Years as Miner” in Taipei. Day after having learned about the disaster at the Yongan Coal Mine. Exhibition ”Hung Jui-Ling’s Watercolors” at Apollo Art Gallery in Taipei, June. Exhibition ”The works of the miners by Hung Jui-Ling” in Chiayi, November. 1989 Exhibition ”The paintings of the miners by Hung Jui-Ling” at Jin-Chiao Bookstore in Taipei, March. at National Taiwan Fine Art Museum, May. 1996 Exhibition ”Hung Jui-Ling’s Retrospective” at Lee Shih-Chiao Art Museum in Taipei, October; ca. 300 pieces of art works of Hung were shown. 1997 Passed away following a heart attack in California, USA.